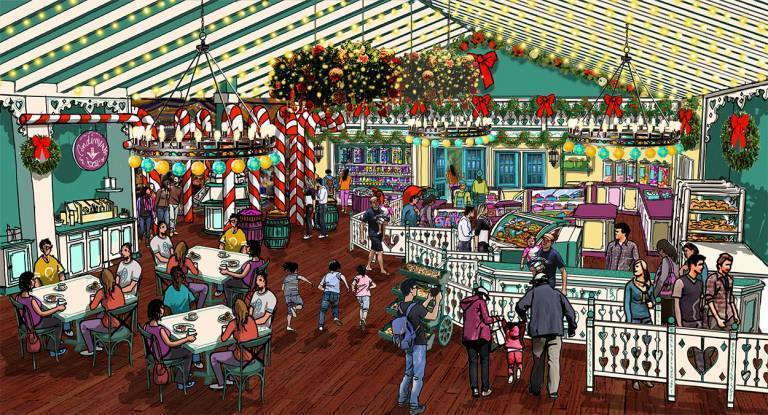 SANTA CLAUS, IND.—–Holiday World’s iconic Kringle’s Kafe will serve its final customers on October 28, as construction of the new Santa’s Merry Marketplace begins in November. “We’re ramping up the theming and the menus for next season,” says park president Matt Eckert. “Santa’s Merry Marketplace is nearly 50 percent larger than Kringle’s. It will include more menu items plus a coffee shop, bakery, candy store, and ice cream shop. Holiday World is open for Happy Halloween Weekends through October 28. Season Passes for 2019 are currently discounted at their lowest prices. For more information, visit HolidayWorld.com or call 1-877-463-2645.